Helping Pet Adoption < Do pets make good gifts? Do pets make good gifts? Recently in the animal shelter and rescue world, we’ve seen a shift among many staff and volunteers about giving pets as gifts. Yes, you still do hear some saying that pets should never be given as gifts. Many hold on to the belief that pets given as gifts are likely to not be as wanted, and therefore not as well cared for or as happy, as pets acquired by the person themselves. They’re not swayed by the studies that show that pets given as gifts are statistically returned to shelters less than adopted pets, because those studies don’t consider the quality of life that pet may have if they are in a home but not really wanted, just there because the gift receiver was too guilty or embarrassed to give away a gift given to them. Most folks though now agree that pets can make WONDERFUL gifts! They key is to carefully consider the individual person, home, the individual pet, and ideally involve the adopting family in the pet selection and adoption process. So what are some things to consider about giving the gift of a pet? 1. Does the recipient want the type of pet you’re gifting them? Talk to them first! For example you may love puppies, but your recipient may be juggling a family or challenging job with other time-intensive activities and prefer an adult or senior pet. You can make your conversation hypothetical if you don’t want to spoil a surprise. 2. Are they ready for a pet right now? Holidays can be a hectic time of the year with family visiting or travel plans. Brining a new pet home is better when the new home has a regular schedule and time to help the new pet adjust. 3. Does the recipient have pet experience? Gifting someone a pet who’s never owned a pet before can be risky business. 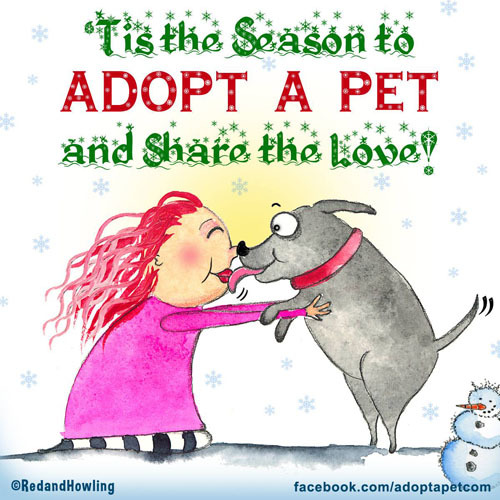 Instead of the gift being the actual pet, how about gifting them the adoption fee and pet supplies? Then you can go to the shelter or rescue together and let experienced pet-placement staff help guide a brand new pet parent to picking a pet that is going to be good for a first-time pet owner. 4. Surprise? Sometimes the magical pet-to-person connection happens in-person, with certain people and certain pets. Every person and every pet is a unique individual personality, and there’s no way to guarantee in advance when the right sparks will fly! So even for pet-experienced people, consider the “surprise” being a gift certificate to a local animal shelter or pet rescue. Then together you can run a search on Adopt-a-Pet.com to find the perfect pet to go visit and adopt! Bonus tip: If before you give a pet as a gift you discover now isn’t the right time or the recipient wants to adopt their own pet, consider giving the gift of a donation in their name to your local shelter, rescue, or donate directly to Adopt-a-Pet.com where your donation will help homeless pets find homes. We hope those tips help you give the gift of pet adoption in the best way possible so that your gift is appreciated and loved for the rest of his or her life with their new family. Want to learn more about giving pets as gifts? Here are more articles you may enjoy! Original cartoon created by RedandHowling: Musings on Dogs, Cats & Other Bundles of Love.